A visit to one of our historical events is like stepping back in time. There is no 21st Century. As far as the eye can see will be people from history going about their business. And with every child in costume, they are accepted onto the Manor as visitors. What news might they bring? "You feel like an idiot dressed up and waiting for the coach, but it is really worth it when you arrive and are thrust back into a really convincing event. The adults that had removed their hats quickly put them back on - you felt wrong without them. 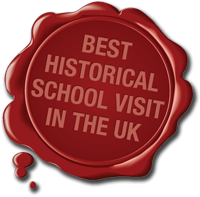 How they persuade even the children to stay so resolutely in character I don't know, but even my really intelligent pupils half believed that they had been transported back to Tudor times." Our Living-Historians meticulously research their roles. Everything they wear, do or say will be historically accurate. For example the blacksmith will be at his anvil working iron, heated to red-hot in the fire kept roaring by young apprentices manning the bellows, into tools for the workers, and tongs and spits for the fire in the manor-house kitchen or hinges and latches for doors for the new barn. At a pole lathe, the wood-turner will be concentrating on turning a perfectly symmetrical wooden bowl for use at table, or matching a set of chair legs. The bearded alchemist will be bent over his still, transforming household wood-ash and distilled water into a caustic solution of lye - an essential ingredient (mixed with a little urine) in the starch used by the laundresses to stiffen the gentry's elaborate linens. Everywhere you look, every sound you hear or smell you notice is one from history. You cannot imagine you're anywhere else but back in the past.